If literacy rates are to be measured by one's ability to sign the marriage register (a somewhat dubious premise at best) then between 1840 and 1900, the rate of literacy increased from somewhere between half and two-thirds to around 97 per cent. There can be little doubt that literacy did increase dramatically during Victoria's reign and this can be attributed to a variety of factors; two of which were the movement toward and the expansion of popular education on the one hand, and the increasing availability of cheap reading material on the other. Because they possessed virtually no general information, their reading matter had to be devoid of all but the most familiar literary and historical allusions; they could not be expected to waste time puzzling over any more recondite kind. And because their attention spans were short, they needed a running supply of excitements, brief and to the point, and sentences and paragraphs to match. The Victorian Era saw a revolution in publishing and particularly in works for the mass market. Improving works and religious tracts were produced in comparatively large numbers and were aimed at the lower end of the reading market. With the success of Pickwick Papers, first published in 1836 as a serial, it became clear that the market for "books" could be increased when they were sold in monthly installments. The greater demand, coupled with the reduction in printing costs meant that it was possible to supply the new market at a lower per-book cost. Newspapers saw the abolition of the newspaper tax in 1855, and in 1861 the duty on paper. Thus, while The Times continued to sell, its dominant position was threatened by the increasing number of penny dailies (The Times continued to charge 3d until 1870). Even so, even the papers entering the market continued to appeal to a more educated class, at least until the 1880s when the impact of Forster's Education Act began to be felt. Sir Robert Ensor, in his magesterial Oxford History of England volume for the years 1870 to 1914, notes that the Education Act taught millions how to read, "without teaching them what to read." By the end of the century, the Evening News and the Daily Mail were directing their appeal to the newly literate working classes. And it was at this class, the barely-literate, that the literary pap, whether in the form of cheap newspapers or Penny Dreadfuls was aimed. Its appeal extended beyond this class, however, reaching even the illiterate who would gather around a reader to hear the latest installment from the pen of (among others) the prolific author, G. W. Reynolds. Penny Dreadfuls were inexpensive novels usually filled with violent adventure or crime and issued in installments. It was a popular genre, giving way, as literacy expanded to adventures aimed at a juvenile population. In their heyday, the Penny Dreadfuls (sometimes called "bloods" or "shilling shockers") were produced en-masse. The reader could be titillated with such titles as "Vice and its Victims," "Wagner the Wehr-Wolf" or "Varney, the Vampire" although perhaps the most famous of all, the tale of Sweeney Todd, the demon barber of Fleet Street was rather more innocuously entitled, "String of Pearls: A Romance." Such works were liberally sprinkled with lurid illustrations and certainly appealing to the Costermongers according Mayhew. What they love best to listen to - and, indeed, what they are most eager for - are Reynolds's periodicals, especially the "Mysteries of the Court." "The Mysteries of the Court of London" which ran from 1848 to 1856 was Reynolds' sequel to "The Mysteries of London," his long running serial first published in 1844.
one which I am prepared in a rather especial manner, not only to declare, but to defend. My taste is for the sensational novel, the detective story, the story about death, robbery and secret societies; a taste which I share in common with the bulk at least of the male population of this world. There was a time in my own melodramatic boyhood when I became quite fastidious in this respect. I would look at the first chapter of any new novel as a final test of its merits. If there was a murdered man under the sofa in the first chapter, I read the story. If there was no murdered man under the sofa in the first chapter, I dismissed the story as tea-table twaddle, which it often really was. He then goes on to declare that any “literature that represents our life as dangerous and startling is truer than any literature that represents it as dubious and languid. For life is a fight and is not a conversation.” Certainly the Penny Dreadful more than fulfilled these criteria! There are numerous examples of the penny dreadful available on line. Click on the titles below to either download or read on-line the book named. To download Wagner the Wehr-Wolf in text format click here. To download Varney the Vampire in text format click here. To read Vol. 1 of The Mysteries of London online click here. To read The String of Pearls, the famous story of Sweeny Todd, online, click here. To read G. K. Chesterton's comments on the Penny Dreadfuls click here. Phrenology, the pseudo-science based on the belief that by examining the shape of a subject’s head, one can determine various traits of character and intelligence was based on the work of the Viennese physician Franz Josef Gall. Popularized in England by Johann Gaspar Spurzheim, it reached its zenith in the latter years of the eighteenth and the early years of the nineteenth century before falling out of fashion. 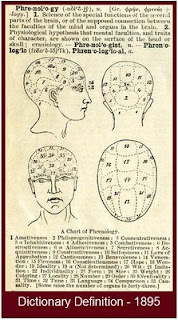 Phrenology returned as a popular “science” in the middle and later years of the Victorian Era. Its popularity was so great that it even became the subject of lectures and classes amongst the working classes at the Windsor and Eton Mechanics’ Institution in the latter years of the 1830s. been lecturing on phrenology at Leicester for about six months, and he also professes to cure all sorts of diseases by means of flannel bands charged with electricity. Calmly viewed, it exhibits only a set of the most unexpected relations, at first collected and examined in the most purely empirical manner, in complete absence of any theory; out of which, by slow degrees, a system has been elicited, of which it can only be said, that at present it exhibits just that sort of rough, general coherency which, in spite of numberless objections in detail, gives an assurance of something too deeply seated in truth to be put down as mere random coincidence or fanciful delusion. Even so, there were many who felt that phrenology had been adequately tested and had failed. Thirty years earlier, in March of 1829, writing in the Edinburgh Review, Lord Macaulay described Phrenology as “laughable.” And by 1855, John Hilton, the foremost anatomist of his day, was combating the doctrines of this pseudo-science, “adducing many anatomical objections to prove the fallacies on which it is based.” Nonetheless, the medical profession was certainly not in full agreement as to the usefulness or even the theoretical structure of Phrenology. And while some treated it with disdain, it was not to fall fully into disrepute until well into the twentieth century. Phrenology was often seen as a joke by Victorians. Light theatrical pieces tended to use it and practitioners were seen as either charlatans or dupes. In 1841, at the Strand a new piece, The Bump of Benevolence, appeared and while the review suggests it had little to do with phrenology, the title is clearly an allusion to it. In 1848, the Lyceum put on Astounding Phenomena, in which one of the main characters is a pseudo-professor of mesmerism and phrenology. In 1867, Tide and Time, A Tale of the Thames, offered viewers at the Surrey Theatre a trial in which an itinerant Professor of Phrenology saves the day (at least temporarily) for our heroine albeit not through any phrenological methods. Phrenology often played a peripheral role in theatrical pieces, and tended to be associated with itinerant “professors,” an association which surely carried with it a certain stigma. Even as late as 1899, Phrenology could still be seen as a theatre piece. In the musical comedy, Florodora, for example, a song entitled “Phrenology” was described by The Times as “capital”. he was chiefly engaged in examining the defendant’s brain—that is, he explained,his phrenological development. He believed, he said, firmly in phrenology. Scientists, however, remained divided on the question of phrenology and it continued to be a subject of some interest. According to The Times of 24 February 1887, at a meeting of the Anthropological Institute (Francis Galton in the Chair) a paper was presented by Professor David Ferrier on the subject of the functional topography of the brain. He expressed his belief that in the present state of our knowledge the data of a scientific phrenology were still very deficient. Here was reason to believe, however, that if the subject were taken up from different points of view by anatomists, physiologists, psychologists and anthropologists, great progress might be made. The great work now to be done was to further ascertain the exact scientific localization of the different faculties by examining scientifically the convolution of the brain a work which Gall had begun, but which unfortunately he left off for the more unsatisfactory science of phrenology. since January 1861 I have been practising Phrenology in the Arcades, Bristol. But my deafness since 1871 has greatly interfered with my pleasure, and my profits, in my work. Burgess’ formal education was limited for, as he notes, he “finally left off schooling about age 14, a poor scholar”. Although he trained as a stone-cutter and was apprenticed to a marble works in the United States, he enjoyed Phrenology, describing it as “fairly profitable, and … a real good and useful profession.” It is possible that while in the United States Burgess was influenced by the phrenologists, Orson Squire Fowler and his brother, Lorenzo. Lorenzo Fowler was to later open offices in London where he performed a phrenological examination of Mark Twain. Some time in 1872 or ’73, the ever sceptical Twain visited Fowler’s establishment using a pseudonym. He found Fowler indifferent and the reading so balanced in terms of his strengths and weaknesses as to amount to nothing in the end. One surprise, however, was to be told that he had a cavity where a bump should have been and this was an indication that he lacked a sense of humour! By the early 1900s, much of the theory of Phrenology had been replaced by the nascent work of psychotherapists like Sigmund Freud whose work was beginning to impact on theories of the mind as well as by the increasing study of the brain itself. 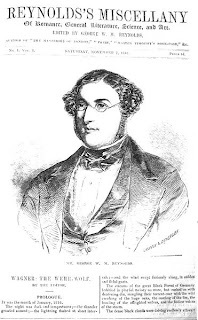 To download George Combe, A System of Phrenology (1837), all 664 pages, click here.